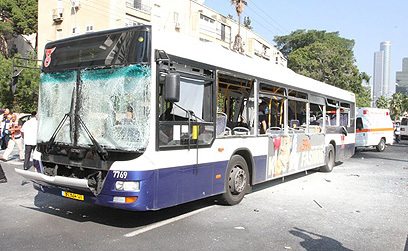 “A terrorist blew up [the #142] bus on Shaul Hamelech Street in Tel Aviv around noon Wednesday. Police confirmed that the explosion was a terrorist attack, although Channel 2 reported that it was not a suicide bombing and thus police were searching the area for additional explosive devises. Haaretz is reporting 21 injuries. Celebratory gunfire was heard in Gaza in reaction to the attack, which was praised by Hamas. … what about doing airstrikes on heavily populated city centers? What about thousands of rockets on Israeli cities, all constituting “heavily populated city centres”? Launching rockets towards civilian areas is as unacceptable as pounding densely populated residential areas with airstrikes. What Hamas’ firing from those very civilian areas? Any condemnation from you, of this unmitigated war crime, you pathetic troll? Not to you it’s not. Israel needs to target all Hamas, Islamic Jihad and Al Aqsa leaders even when they hide among civilians. This is the only way to defeat this satanic verses religion. Israel needs to stop having regard for these Hamas, Islamic Jihad and Al Aqsa evil leaders, even when they hide among Gazans, since 85% of Gazan’s support their murderous aims. To defeat Hitler, the allies had to bomb all German cities to the ground. As Kahane said, no Arabs = No Terror. I’ll add, No Ayatollah’s = no Terror. No Ergodans = no Terror. Oh dear. Just kill all the Arabs – right? Very good pretzelberg. There was a terror attack against a civilian autobus in Tel-aviv and you can easily find the target of your moral and noble indignation. I have already expressed my indignation about the cowardly bombing. You a Kahanist too, then? I know you are not. So why defend Ed Frias? I’m not a Kahanist and I don’t defend anybody. This thread is not about Ed Frias and not about Kahane but about Arab terrorism. You are correct on that last point. And yes – I do appreciate that the atmosphere in Israel today is extremely (and understandably) tense. It is very good to read this kind of articles, but sadly this was photographed in Berlin too.